In an arid, poor corner of India swept by climate change, Shyamrao Patil and wife Laxmibai–both studied till class three–have found ways to cope & profit: By adapting farming techniques, using government subsidies and cooperating with others for water and finance. I read this article and found it very interesting, thought it might be something for you. The article is called As India Struggles With Climate Change, Farming Couple Learns To Cope And Flourish https://www.indiaspend.com/as-india-struggles-with-climate-change-farming-couple-learns-to-cope-and-flourish-24501/. Kalaburagi district (Karnataka): “Year by year, the quantity of rainfall is decreasing,” said Shyamrao Patil, 55, a lungi-clad, generously mustachioed wiry farmer who has learned to read the changing seasons and--most importantly--adapt to them in a country where climate change has started affecting the livelihoods of a fifth of the population, or 263 million people, that depends on farming. Here in the pigeon-pea (tur dal) bowl of Karnataka, Patil and his wife Laxmibai, 50, grow a variety of crops as one bet against climate change in an area where farming risks include water scarcity, increasingly erratic rain, rising temperatures and decreasing soil quality, we found in a 2018 study of 419 farm households. Further, 91% of farmers surveyed in Kalaburagi reported a decrease in rainfall over a decade to 2016, and 61% reported regular scarcities of water for farming, we found across four blocks in this arid, poor northern Karnataka district where several human-development indicators match those in India’s poorest state, Bihar. Patil and his wife--both have studied till class three, in a district with a literacy rate of 65%, lower than many Bihar districts--represent communities in India’s drylands who have a history of coping with and planning for climatic risks. Some examples: Water harvesting in Rajasthan and tank irrigation across South India. Diversifying risk, investing in machines to process some of their crops, utilising government subsidies and participating in collective efforts to market crops and store water--these are some of the techniques the Patils have learned and now teach others. They offer a template that could be used in many parts of India in an age of shrinking landholdings, growing water scarcity, climate change and agrarian distress. To capture similar examples of bottom-up solutions to the constraints farming faces today, we studied eight progressive farmers in Gulbarga and Kolar districts in Karnataka, all recognised as “progressive farmers” by the state government and, as we argue, are champions of sustainable farming practices that hold lessons for building climate resilience--or the ability to manage change, reduce disruptions and enhance opportunities. From fires in Greece to flooding in Laos and heatwaves in Japan, the effects of climate change are widespread. Closer home, a July 2018 World Bank report warned that climate change will lower the standards of living of nearly half of India’s population by 2050. These changes are already being felt in India’s semi-arid regions, which have expanded by 10% in recent decades. These regions include swathes of Rajasthan, Gujarat, Maharashtra, Karnataka, Andhra Pradesh and Tamil Nadu that are home to India’s most vulnerable people. In addition to the impacts of climate change, rural India is witnessing growing agrarian distress despite bountiful harvests, as IndiaSpend reported in June 2017. Caught between fluctuating market prices and growing indebtedness, many farmers regard agriculture as an unviable livelihood: A fourth of 50,000 farmers surveyed nationwide said they would quit farming, if they had an option, according to this February 2017 study. How then can governments and development agencies encourage farmers to invest in their land, and--most importantly--help farmers adapt to a changing climate? Some answers are available in Kalaburagi and the life of the Patils. Nearly three times as large as Goa or a fourth as large as the Netherlands, Kalaburagi, formerly called Gulbarga, is a drought-prone region that receives an average rainfall of 842 mm annually--the Karnataka average is 1,248 mm--with temperatures varying from 45°C in the summer to 10-15°C in winter. Farms in the tur dal bowl of Karnataka now face rising winter temperatures and erratic rainfall. Kalaburagi is a drought-prone region that receives an average rainfall of 842 mm annually--the Karnataka average is 1,248 mm--with temperatures varying from 45°C in the summer to 10-15°C in winter. Shyamrao has discussed a collective effort with other farmers to store water by constructing farm ponds and check dams. Karnataka is a pioneer in community watershed development and deploys government programmes, such as the Mahatma Gandhi National Rural Employment Guarantee Scheme--the world’s largest make-work project--to drought-proof farms. For a smallholder farmer in water-scarce, rain-fed conditions--no more than 17% of farmland in Kalaburagi is irrigated; the Indian average is 58%--innovating is a challenge, but that is what the Patils have done on their farm of 3.5 acres, not much larger than the Indian norm: Nearly 85% of working farms are smaller than two hectares, according to 2013 National Sample Survey Organisation (NSSO) data, the latest available. 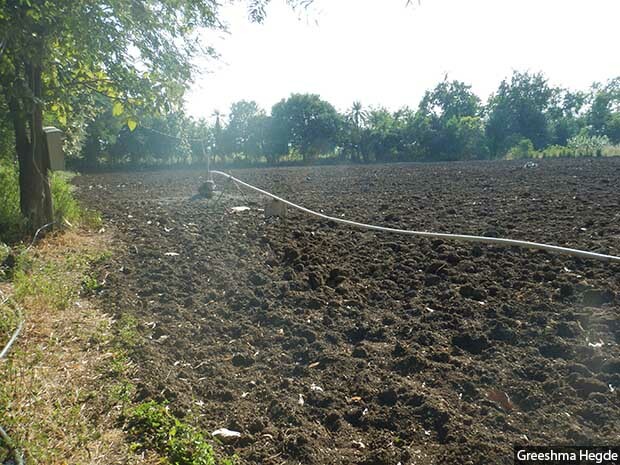 Shyamrao and Laximibai use what is called a mixed-cropping system--growing two or more crops together to confer ecological benefits--to grow tur dal, onions, wheat, jowar, groundnut, sesame, tamarind, mangoes and curry leaves. They also run a dairy and poultry farm with eight cows, 150 chickens and 28 goats. Their annual income reaches Rs 500,000, of which Rs 250,000 is the estimated profit. In 2007, the Patils--instead of selling their produce to middlemen--invested in mini tur dal mill after consulting Kalaburagi agriculture department officers, who also helped them with a government subsidy. The mini dal mill allows them to process raw tur into dal to make sambar. They have also purchased shavige (rice vermicelli) machines, which lets them make rice noodles (used for breakfast) that are then sold to their neighbours. In 2007, the Patils--instead of selling their produce to middlemen--invested in a mini tur dal mill after consulting Kalaburagi agriculture department officers, who also helped them with a government subsidy. The mini dal mill allows them to process raw tur into dal to make sambar. Such subsidies, said Shyamrao, are “very useful” for small land holders like him and critical to those who do not have extra cash to invest in post-harvest infrastructure. 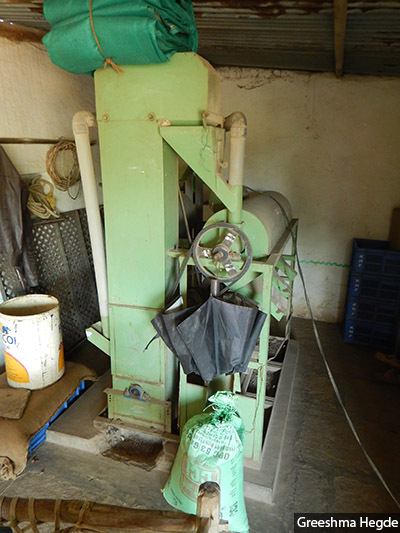 The dal machine, for instance, allows the Patils to sell powdered tur at Rs 140 per kg in markets across Karnataka, Maharashtra and Gujarat--the raw tur sells for Rs 100 per kg in Kalaburagi. They have also learned to work with others like them. The Patils are one of 13 members of Bhagyavanthi Sangha, a self-help group from their village that allows them to sell their tur and green gram in places as distant as Madhya Pradesh, Kolkata, Ahmedabad, Hyderabad and Delhi. Shyamrao grew up watching his mother, also a farmer, using synthetic fertilisers on their 8-acre farm but observed that increases in yield were not substantial. He switched from conventional, chemical farming to organic farming on the 3.5 acres he inherited. His decision to switch to organic farming occurred after he attended a training programme organised near his village in 1997. That’s where he learned about the benefits of organic farming. A mixture of compost and black soil in the Patils’ fields. Shyamrao Patil switched from conventional, chemical farming to organic farming on the 3.5 acres he inherited after he attended a training programme organised near his village in 1997. Eager to try it, Shyamrao sought help from NGO workers, who in turn sent him earthworms accessed through the agriculture department. Gradually, the Patils began moving to organic farming. In the, first year, nearly two decades ago, they mixed diammonium phosphate (DAP), a widely used fertiliser, and vermicompost in equal measure. In the second year, they mixed half a bag of DAP with one bag of vermicompost; in the third year, 10 kg of chemical fertiliser and three bags of vermicompost; by the fourth year, only five sacks of vermicompost were used and no chemical fertiliser. 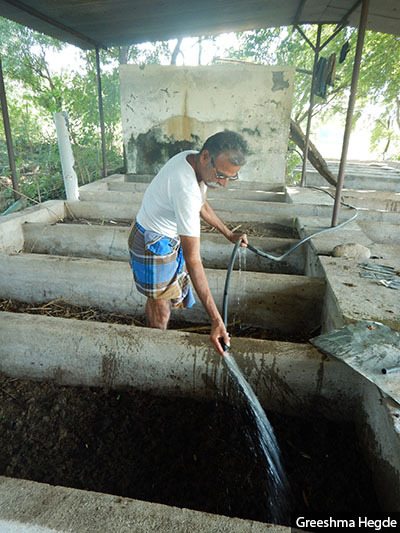 Shyamrao Patil watering his vermicompost pits. The Patils began moving to organic farming gradually. In the, first year, nearly two decades ago, they mixed diammonium phosphate and vermicompost in equal measure. By the fourth year, only five sacks of vermicompost were used and no chemical fertiliser. 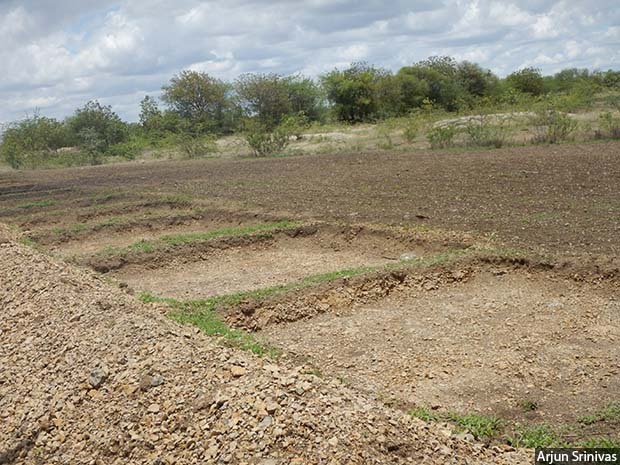 DAP use has dropped and vermicomposting has increased around his village, said Shyamrao, an observation confirmed by the Samata Loka Shikshan Samiti (Equal World Education Board), an NGO in Aland Gulbarga. He has trained about 150 other farmers through the Samiti and other NGOs, such as MYRADA. We observed that the experiences of progressive farmers, such as the Patils, are powerful triggers for others to follow suit and further spread knowledge. In 2000, Shyamrao and Laxmibai set up their own farmer group called Punyakoti, comprising 15 farmers from their village; they meet regularly and make sales for their produces such as tur dal and green gram. Of the 419 households we polled, 12% mention that they accessed information provided by the Krishi Vigyaan Kendra, a farm knowledge centre run by the government, in Kalaburagi; 85% of these found the information to be satisfactory. It is significant that 85% of the households depend on family or neighbours, 1% on government, 1% on on politicians and 2.5% on NGOs/community groups in times of distress. The Patils are now key facilitators in the exchange of knowledge among farmers who are willing to try new methods. Shyamrao also helps other farmers secure financial support. He has helped five farmers in his village to get loans worth Rs 250,000. For their efforts to demonstrate thriving agricultural practices despite scarce water, in 2008-09, the Patils were awarded the Krishi Pandit Prashasthi (progressive farmer award) for organic and integrated farming, given every year for the last 18 years by the Karnataka government. The award is one of 30 that the Patils have received. Shyamrao and his wife have built social networks and helped these networks--as we said--access technical know-how and financial support in the form of subsidies. They have also innovated by changing their farming practices to make them more sustainable, diverse, and remunerative, thereby climate-proofing their livelihood. The Patils are an example of how a mix of state support, NGO action, and farmer innovation can drive bottom-up solutions that are adaptive, sustainable, and--importantly--financially viable.